Video editing isn’t something I am too comfortable with. There are issues to do with controlling or directing to an extent what the viewer sees that I am uncomfortable with. Which seems a dichotomy when making a piece of art work? One thing I have considered post the MA is taking a course in video making and editing and also looking for a collaborator to make some films with. Some to be on the other side of the camera, who could bring their own area of understanding and expertise to a project. This aspect of visually controlling or directing a piece is for me less of an issue when doing a live cast work. I think it also demands a different kind of engagement from the viewer who becomes less passive through acting as a witness to a live event. There is also the element of time and lived time that a live cast piece engages in. What I bring to my work and what is integral to it is the use of my own body. Another issue that is beginning to come a little more in to focus at this point of the course is why it feels so difficult to create a ‘finished’ piece (especially since the zines are always part of a very clear production process). It might be that I haven’t yet established a defined process I am comfortable with in order to create a finished work. But it does instinctively feel more to do with holding up the wrong expectation in relation to the ensuing ‘product’ created through my practice. I hope to move forward from this MA and begin to review working practices and evaluate possible out comes in terms of recording and methodologies of creating work. When I began the MA I expected to find a digital tool or methodology in order to ‘become’ a digital artist. Through watching my peer’s project development e.g. May, Ina, Rod and many others I began to feel a discrepancy in our directions especially when I found using soft wear applications such as Dance Forms, Korsakow, and Adobe Premiere Elements so stifling. What digital processes has given me is not so much a direct tool to house or deliver/create a work, but more of means through which to question and examine something that was so familiar I couldn’t see it clearly. There are so many exciting new pieces of interactive and digital works that are inspiring and raise engaging issues. I would very much like to try again with Isadora interactive softwear and also Korsakow, but really feel now need to go away and spend time working on my practice and further refining my understandings. The next challenge will be establishing an ongoing practice outside of the MA, this is something I’m looking forward to. It wasn’t initially, but reviewing unit 2 has provided the realisation that there are more questions and ideas to pursue and that the MA has established a mode of practice which should stand me in good stead for moving forward. a) Venue. Had a possible venue which has fallen through. Need to rethink about the space/environment. b) Personal issues which mean it is not always possible to keep commitments. So being able to provide live broad cast over several days is a gamble. 2) Interactive Korsakow based piece. Have used Korsakow previously in unit one for the college interim show, and is a project that has been an ongoing part of my MA project. Below is a link for a test site. There are issues with compression of file sizes on the test site which are getting resolved. There maybe issues around file storage size so have been looking at web hosting for the project. Had help from my sister and her partner with setting this site up. Please scroll down the page to click on a thumb nail video clip. 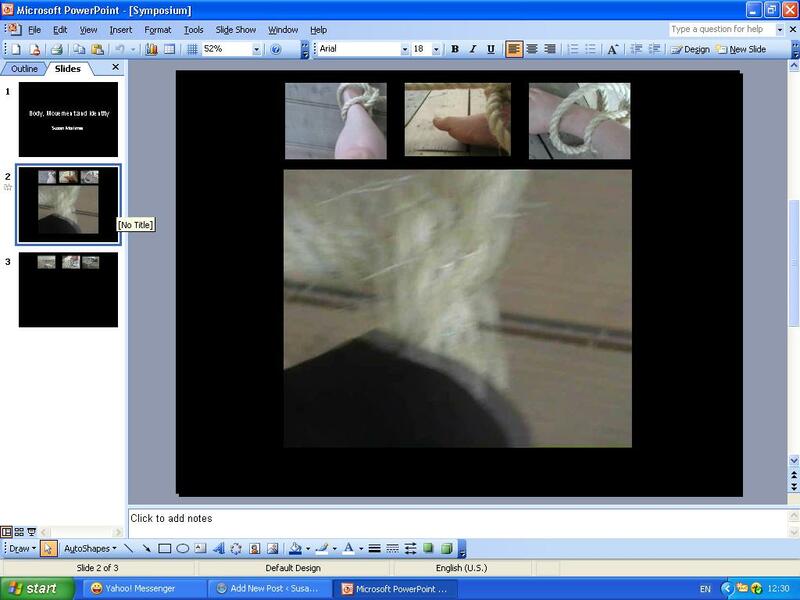 Korsakow allows a random element in linking videos which echos the unpredictable nature of the human body. These are quite different project outcomes. But the aim is to keep the door open on pursuing the actuation while finishing the Korsakow project in the next few weeks. This week has been spent focusing on the essay. It is great to begin to draw the ideas out. There is still a way to go and it isn’t a process that comes naturally, but like I said last week, it is a process that I am enjoying. In Tuesday’s online chat we had individual chats with Andy, so I was able to discuss the essay. Andy was asking when a photograph became a photograph: When you push the shutter button, when its stored in the camera or when it is printed. From reading an article by Cathy Weis on ageism, I am beginning to question if my understanding of embodiment. I have been thinking of embodiment in a linear way, time based due to our biological nature, and if in fact the notion of embodiment is far more diverse, and possibly more like a tag cloud. I have read recently that can be argued is that rather than disembodying us cyberspace has in fact has embodied us. But having shown it to a couple of friends and discussed the options with them, they advised me against trying to travel down to Camberwell and create an installation. Their feedback was the ideas in the presentation were too ambitious in relation to my resources and situation. So had a good think through options and am going to look in to making a non linear narrative piece with Korsakow. That way all my recourses will be directed to a focused and contained piece and the time frame will be more realistic. So the next step will be to spend a bit of time going back over Korsakow with my sister who knows more about the programming than I do and get up to speed and aim to put another draft presentation for the prototype together in a week or so. I am comfortable with proceeding with a more contained project, a lot of my worries for the final piece have been based on options of getting down to London. Korsakow is a structure that feels appropriate as it allows for interaction and the non linear narrative structure is representative of the way digital media has opened up choices and changed familiar processes. It feels as if it may echo some of the ideas above about the cyber world freeing us from a linear time biological lead understanding. Appreciating why some of the questions we were posed in the early part of this course matter so profoundly, such as who controls the net and the sharing of information. Given how societies have structured and controlled themselves with biological based hierarchies that are in many ways obsolete in cyber space. (These some how are often found re asserting themselves. Like the sexual stereotyping of many avatars). Just to end on an exciting piece of news about Mail Art One. At the end of last week I was contacted by the gallery director for the DLI gallery who wished to contact one of the contributors with a view to working with them. I am really pleased about this as it was one of the things I hoped might be achieved through the publication. Its aim was to be eclectic, democratic open to any one who wanted to could be included. I am glad I stuck at producing it. It feels really good to have facilitated that introduction.